Falasmaryon is a stronghold deep in the northern Ashlands, across the Foyada Bani-Dad from Maar Gan. It is one of the few strongholds with a sewer system. The strongholds seem interesting to the traveler, but should be approached very carefully. They have largely been abandoned, but have since generally proved attractive to whatever group feels strong enough to hold them. At last report, Falasmaryon has been taken over by the Sixth House. Within you will find all sorts of ash creatures and three Dagoths, Dagoth Ganel, Dagoth Mulyn (in the Sewers), and Dagoth Tanis. The only other resident is the Master Trainer of Marksman, Missun Akin, who has taken up residence in a hut on top of the stronghold. In addition to Marksman, Akin offers major training in Athletics and Long Blade. Falasmaryon has a propylon chamber linking to Valenvaryon and Berandas. 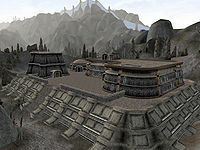 Falasmaryon was originally intended to be named "Falagmaryon", a fact which you can see by looking at the propylon in the two adjacent fortresses which teleport there. The texture names also use this spelling. The Falasmaryon Propylon Index can be found for sale by Salen Ravel as an offering to the shrine in Maar Gan if the Master Index plugin is installed. If the Master Index plugin is not installed the Index is not for sale and must be stolen. In the first room on your right from the main entrance, lies the corpse of Irer Nervion wearing a Glass Cuirass, Greaves, and Boots. He is also wearing the Nervion Ancestor Ring, which can summon an ancestral ghost for 60 seconds. In this same room, there is a chest with potions. Next to Dagoth Tanis is a nice collection of loot. There are two books: Smuggler's Island, and The Wolf Queen, Book II, which raise your Spear and Hand-To-Hand combat skills respectively. Two chests with gold, two scrolls and a Sixth House Bell Hammer complete the haul. There are two locked chests on the upper level containing potions and low value clothing. At the end of the sewers are two corpses containing items. The one lying in the water below the other corpse will have an enchanted item. This page was last modified on 19 October 2018, at 20:32.